Charge and Sync your Apple Lightning-equipped devices over longer distances. The USBLT3MB 10ft/3m Black Lightning to USB Cable for iPhone, iPod and iPad is colored to suit your black mobile devices and enables long-range syncing and charging of your Lightning-enabled mobile digital devices - making it ideal for people on the move who need to access their device while it's charging. The cable features heavy gauge (20 AWG) wire for overcoming distance restrictions and allowing for full charging power at a distance of up to 3m, with no loss of charge time.The reversible 8-pin Lightning connector can be plugged into your iOS-enabled device with either side facing up, meaning there is no wrong way of inserting the cable into the device.This durable cable is Apple MFi certified. 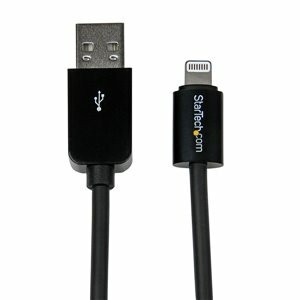 The USBLT3MB 10ft/3m Black Lightning to USB Cable for iPhone, iPod and iPad is colored to suit your black mobile devices and enables long-range syncing and charging of your Lightning-enabled mobile digital devices – making it ideal for people on the move who need to access their device while it’s charging. The cable features heavy gauge (20 AWG) wire for overcoming distance restrictions and allowing for full charging power at a distance of up to 3m, with no loss of charge time.